After 3,000 furniture workers struck on Monday, thousands more walked out over low wages. Thanhniennews.com reported that over 4,000 workers walked out over low pay Monday at four foreign companies in the southern Vietnamese province of Dong Nai and as of yesterday were continuing to strike work at three of the firms. The workers of the Singapore-owned Asia Garments returned to work after the company agreed to raise their salary by 7 percent and pay a monthly allowance of VND50,000 (US$3.1). Workers at the Taiwanese-owned textile company, All Super, complained not only about low wages but also about being forced to work up to 1,000 hours overtime a year which is five times higher than allowed by the Labor Law. The company wanted workers not only to work Sundays but also to forego all leave if there were contracts. At a mediation session brokered by the local labor union, the company promised to reduce overtime and not to work Sundays. But since it only agreed to raise wages by 3-3.5 percent, the workers rejected the proposal and continued their strike. The managers of Japanese-owned Haranda company also refused a significant raise. Another Japanese company, the chemical manufacturer Mitani, decided to give its workers a 15-day holiday to “discuss and settle the situation”. In another Dong Nai-based foreign company, Hong Kong’s Peaktop, where over 740 workers began a strike earlier, it continued into the fourth day Monday after the management refused to raise their wages by more than 5 percent. Between 15 and 30,000 workers have taken part in 16 walkouts, mostly wildcat strikes, in the province since January. 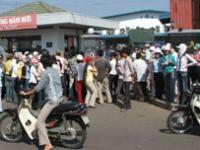 In Vietnam, strikes that do not go through trade unions are illegal. A wave of strikes hit foreign-owned companies across southern Vietnam last year, with tens of thousands of workers participating. The government has, since, increased the minimum wage at foreign firms by 25 percent. For the background to these recent struggles, playfuls.com reported that most foreign companies grant yearly salary increases during the lunar new year, celebrated last month in Vietnam, but there is no set amount. Kiet said this year some factories raised pay as little as 25,000 dong (1.5 dollars) per year. The average pay of a Peaktop employee is 845,000 dong (52 dollars) per month, barely above the minimum wage of 790,000 dong (49 dollars) per month for the province, according to the local newspaper Tien Phong. Peaktop officials could not be reached for comment. Dong Nai province, which lies directly north of Vietnam's southern commercial centre Ho Chi Minh City, has an estimated 540 partly foreign-owned factories employing more than 280,000 Vietnamese. Following the wage increases granted after last year's strike wave, several foreign investors - particularly Taiwanese - complained about the government's move to suddenly raise the minimum wage without notice, warning that the manufacturing that had rushed in could leave if wages rise too high and government interference becomes cumbersome. Still, Vietnam's wages remain an estimated 30 per cent lower than in parts of China, prompting thousands of new factories to set up in the last five years.